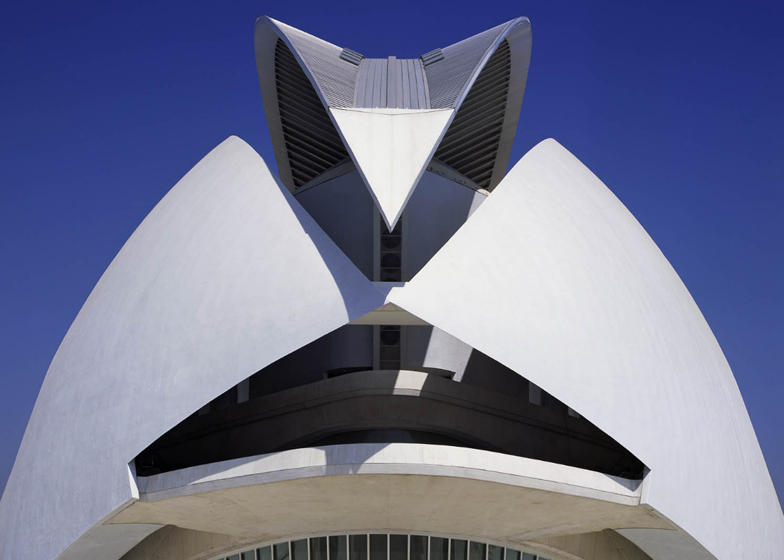 News: architect Santiago Calatrava is facing legal action from his home city of Valencia because parts of the opera house roof at his City of Arts and Sciences complex are falling off just eight years after completion. Sections of the swooping mosaic roof of the Palau de les Arts Reina Sofia opera house at the Ciudad de las Artes y las Ciencias de Valencia came away in high winds on Friday, forcing authorities to cancel performances and close the building to the public. Regional government spokesman Maximo Buch announced on Friday that Valencia would sue Calatrava and his architectural firm for the cost of repairs, and said that the building will remain closed until it can be made safe again. A technical report on the state of the building is due next week. The opera house is one of seven buildings that comprise the City of Arts and Sciences complex, opened in October 2005 and constructed on reclaimed land in the city's former port. The white concrete opera house features a feather-like roof sailing over two outer shells that curl round the sides. These are clad in a layer of ceramic mosaic tiles or "trencadis", which first showed signs of ageing a year ago when wrinkles appeared in the smooth white surface and is now coming away in chunks. Calatrava has been heavily criticised for the cost of the City of Arts and Sciences complex and was accused of "bleeding Valencia dry" over alleged fees of €100 million for the showpiece cultural centre, despite it coming in four times over budget at over €1 billion. The starchitect is no stranger to legal disputes over his buildings and had to pay €3.3 million to settle a dispute last June after a conference centre he designed in the northern Spanish city of Oviedo suffered structural collapse. Meanwhile the owners of the Ysios winery in Spain have launched legal action demanding he pays €2 million so they can appoint a new team of architects and engineers to fix the building's leaky roof, following repeatedly failed attempts by Calatrava's builders to solve the problem. His footbridge to the Guggenheim museum in Bilbao has also caused controversy, with the city having to pay compensation to dozens of pedestrians who slipped on the glass surface in wet weather, while Calatrava is also being taken to court due to his footbridge over the Grand Canal in Venice coming in three times over budget and requiring what the city sees as excessive repairs.